One benefit of having a large age gap between my children is watching the evolution of toys. I tell you, the toys for today’s babies and toddlers are most definitely a lot cooler than when my older girls were Bella’s age. I had totally planned on putting this together after Bella had gone to bed but she had other plans. Once she saw the box she started screaming “I’m so excited”. Her squeals of joy melted my heart and I set out to put this together myself. I have to say, she was pretty patient for a toddler. I mean, she sat there and watched intently as I screwed the pieces together and placed the stickers on her new kitchen. Every now and again she would let out a squeal of excitement as it got closer to being “all done mommy”. 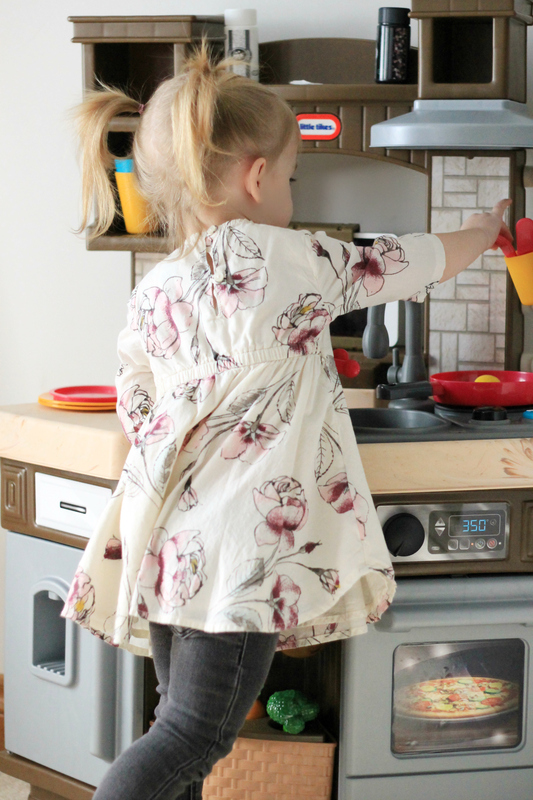 Once it was set up, which by the way was fairly easy, she waisted no time starting to explore her new Little Tikes Cook ‘N Learn Smart Kitchen. 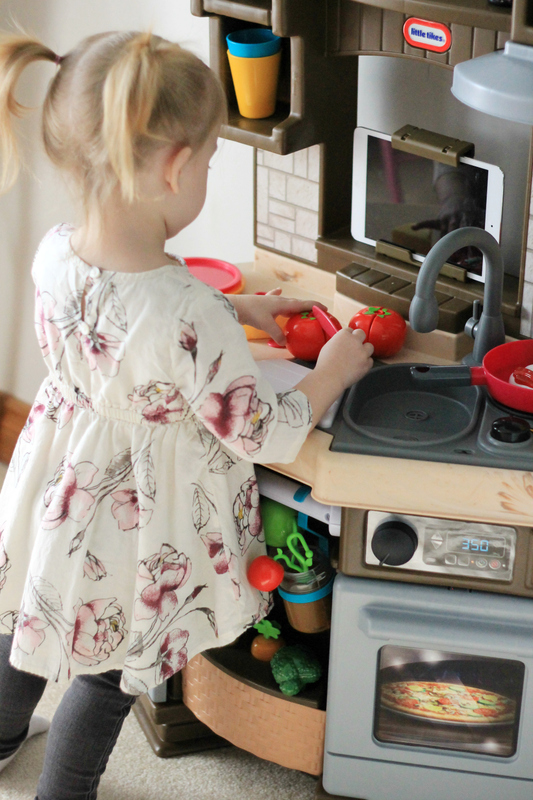 As she explored I took her iPad and began to download the app that works with this kitchen. Now, I was going to leave this part out, mostly from embarrassment but, I will tell you now that I can laugh at myself. So, after downloading the app I opened it up and began to check it out. The little adorable veggies and fruits were dancing around the screen, mouths moving, no sound. So I checked the volume and it was on full blast. I thought, maybe the iPad was having a moment so I turned it off to reboot. Once it reloaded, I opened up the app and tried again. Still no sound. Next, I called the customer service number and they tried to trouble shoot with me to no avail. I deleted the app and reinstalled, still no sound. At this point I was thinking maybe the app has a glitch so I emailed my contact for this review. He sent off an email to see if anyone could help. Not long after he told me he had set out to fix this problem I solved the issue. Are you ready? Bella, yes I am totally blaming my toddler, at some point must have slid the silent button to on at the side of the iPad. So, hanging my head in shame I emailed my contact back and told him the story. 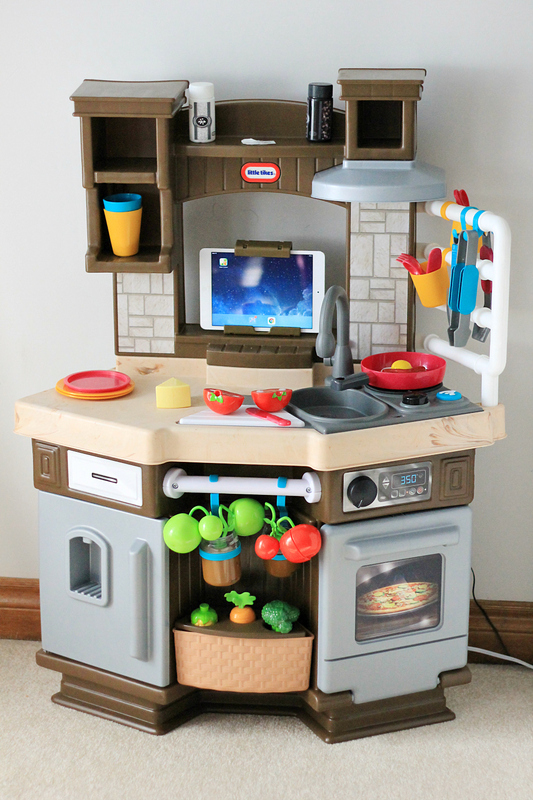 The Little Tikes Cook ‘N Learn Smart Kitchen has an engaging and unique play experience that kids will love! 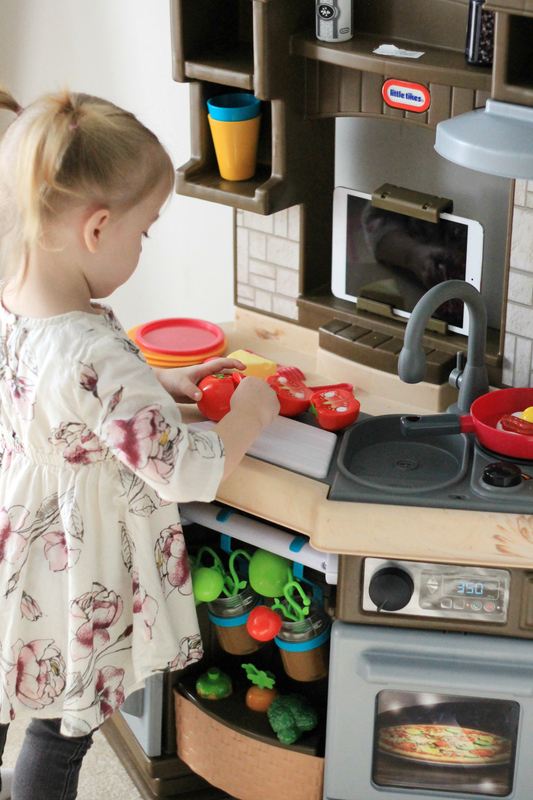 The kitchen has interactive accessories that come alive with the integrated App that is downloaded to your tablet with iOS7 and above or 4.3 or higher Android mobile device. Devices must support Bluetooth LE for the app to sync with the kitchen. This kitchen really comes with the works. There are a total of 46 accessories included. From utensils to plates, pans, pots, food, and more. Some of the food can be cut like the tomatoes. They have velcro that holds the two pieces together and easily come apart when sliced with the knife. Bella really enjoys cutting her food! Many of the accessories have a RFID chip. This allows them to interact with the app. 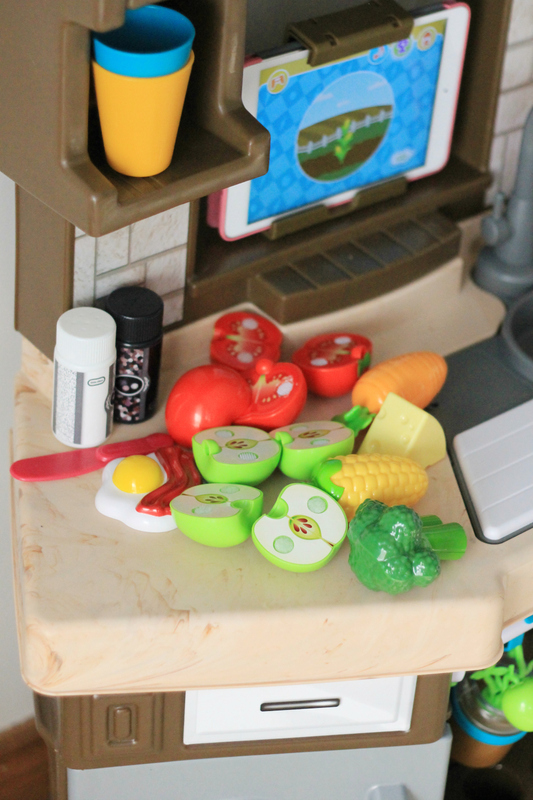 The items with the RFID chip are: frying pan, pot, chopping knife, spatula, tomatoes, apples, carrot, broccoli, corn, egg, cheese, pizza, hamburger, and apple pie. Bella loves playing with the app. It has great interactive games, songs, and more. The app also rewards them with cute stickers and trophies. I love that this is a toy that will grow with her. 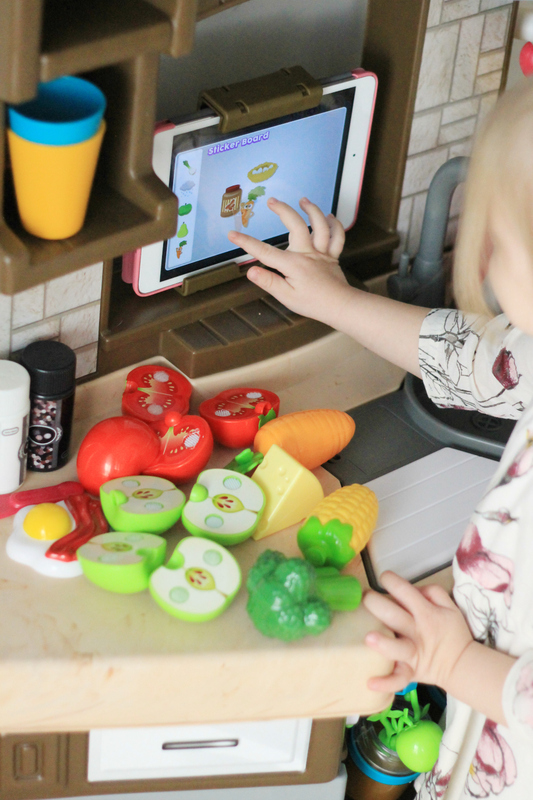 The interactive kitchen App includes 4 modes of play. Traditional role play, the app recognizes and responds to the item they are using with fun animation, encouraging phrases, and fun food facts. They can choose a recipe from the app’s recipe book and follow the steps to make one of many delicious meals. Bella loves to dance to the many classic nursery tunes, each with special written lyrics that teach letters, numbers, and how different plants grow and become food. There are both toddler or preschool modes and three different games to play in the app. 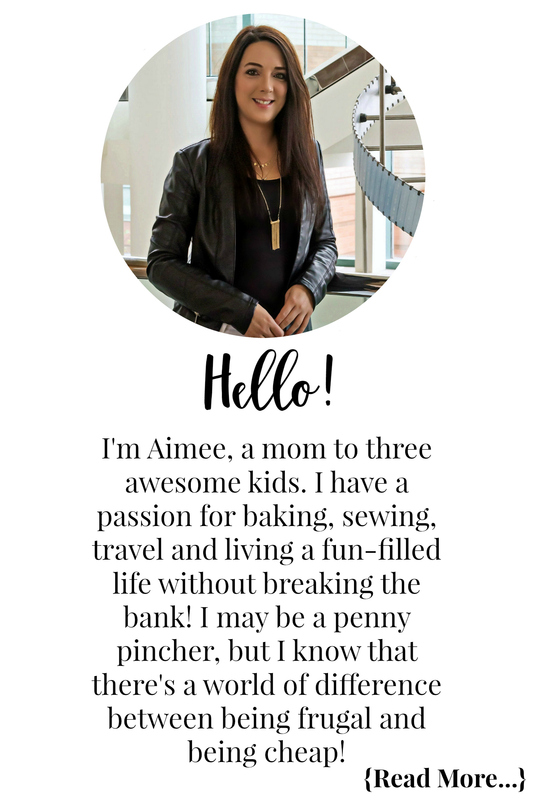 The app is sure to keep them entertained and learning for hours! Which feature do you think your little one would like most? Let me know in the comment section below. 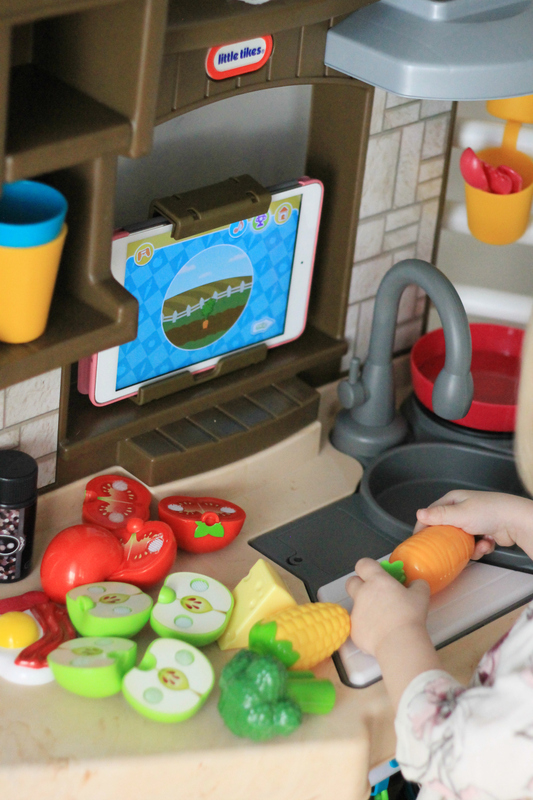 You can find Little Tikes Cook ‘N Learn Smart Kitchen online at Amazon. For updates and more be sure to follow Little Tikes on Instagram, Facebook, Twitter, and YouTube! Disclosure: Although we were sent product for review consideration, the opinions and language are all my own, and in no way do they reflect Little Tikes. Any product claim, statistic, quote or other representation about a product or service should be verified with the manufacturer, company, provider or party in question. This is just super cute and I know my daughter would absolutely LOVE this!